PARIS -- Renault SA said first-half operating profit fell 19 percent as supply problems and raw-material costs compounded weak European demand for aging models such as the Clio compact. 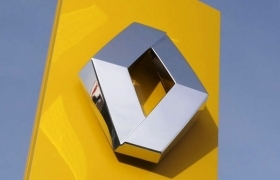 Operating profit excluding one-time items dropped to 630 million euros ($904 million) from 780 million euros, Renault said in a statement on Thursday. Analysts had expected profit of 595 million euros, based on the average of nine estimates compiled by Bloomberg. Revenue rose 7.3 percent to 21.1 billion euros. Renault's results are "better than the market's very low expectations after the French market-share meltdown in June," said Max Warburton, a London-based analyst at Sanford C. Bernstein. "Growth outside Europe will continue to support our sales performance," Tavares said at an analyst conference at the carmaker's headquarters. Renault, hurt by a lack of recent model introductions, is losing European business to rivals Volkswagen AG and General Motors Co. The carmaker is due to unveil a revamped Twingo mini at September's Frankfurt auto show and an all-new Clio next year. The company has blamed supply problems, some resulting from the Japan earthquake in March, for falling sales of models including the Dacia Duster SUV, as delivery times mount. Renault's share of European car registrations fell to 9.5 percent in the first half from 10.5 percent a year earlier, according to data from the Brussels-based European Automobile Manufacturers' Association. "The environment is worse than we'd expected," Chief Financial Officer Dominique Thormann told reporters. "Our supply chain was already under strain at the start of the year." Renault said supply constraints are expected to subside gradually in the second half, enabling a strong recovery in production from September. Revenue rose 7.3 percent in the first half to 21.1 billion euros, Renault said, while net income surged to 1.253 billion from 823 million in the year-earlier period. Thormann told journalists the increase was due to several factors, such as lower financial charges after Renault paid back loans including one to the French government. It also had a greater contribution from partner Nissan, AvtoVAZ and Volvo, in which Renault owns stakes. Nissan on Wednesday reported a smaller-than-expected dip in quarterly profit, showing it recovered quickly from the quake. Renault reiterated its February forecast for a full-year increase in deliveries, with automotive free cash flow above 500 million euros. The carmaker trimmed its 2011 global auto-market growth forecast to 3 percent to 4 percent growth from 6 percent previously, with emerging markets as growth drivers. The company said the European market should remain stable or even contract slightly by 2 percent for the year as a whole, with a 4 percent to 6 percent decrease in the French market. "In this context, Renault expects to post higher sales volumes and revenues than in 2010," the company said. In the automotive division, the first-half operating margin came to 221 million euros, or 1.1 percent of sales, compared with 410 million in the first half of 2010. The company reiterated its own target of automotive operational free cash flow above 500 million euros in 2011, with a ratio of capital expenditures and r&d below 9 percent of revenues. French rival PSA/Peugeot-Citroen on Wednesday abandoned its goal of increasing full-year automotive earnings because of rising material costs, and said supply disruptions from the earthquake will cut second-half earnings by 100 million euros. PSA posted a 1.8 percent first-half margin for its manufacturing division. "Following the negative outlook for the rest of the year presented by Peugeot yesterday, Renault's results make for more reassuring reading," said David Arnold, an analyst at Credit Suisse Group. "Crucially, Renault only sees half the negative Japan impact that Peugeot is predicting." Bernstein's Warburton said: "Given that Peugeot seems to have a better product lineup at present, it's interesting that Renault's financial results look so similar."